Who will be the next to wear your gown? Will it be your daughter or your granddaughter, your cousin, your future daughter-in-law? Preserve your special gown for her – the right way – with a true preservation. Why are sugar, salt and acid important? Gowns should be treated with the true preservation process as soon as possible after the wedding before stains can set and sugar begins to caramelize. Do not keep gowns in plastic bags – plastic emits fumes that yellow fabric – and never store gowns in humidity. You receive a written 100% international guarantee against sugar stains or yellowing of the gown. When the gown is to be worn again, it will be inspected and pressed by any participating Wedding Gown Specialist at no charge. If you want to keep your gown in the family, choose your gown preservation service carefully. As a general rule, avoid a service that promotes “vacuum-packaging” as the plastic in which the gown is sealed can trap moisture and emit fumes that yellow the gown. One cleaner uses pretty much the same chemicals and solvent as another, but very few cleaners actually do their own work and clean wedding gowns at their locations. Some do not know that shoulder pads, bust pads, and underarm shields should be removed because they are made of materials that can bond to the fabric of your gown and destroy fibers. Others have no idea gowns need special packaging, and some offer no guarantee. You need to ask lots of questions before you make a final decision. Is the work done locally so you can personally inspect your gown after it is cleaned? What special precautions are taken to protect delicate trims & decorations? How does the service guard against latent stains caused by alcohol & other sugar-based stains that do not dissolve during ordinary dry cleaning (these will eventually caramelize into dark brown spots)? Does the service provide an environmentally safe acid-free container that will not discolor or damage the fabric? Is the tissue and bust form used to stuff the gown acid & lignin free? Both sealed & unsealed plastic containers can trap moisture, and both-even chemically inert plastics such as the one trademarked Coroplast-also set up an electrostatic charge that can permanently set wrinkles in the gown. On the other hand, acid-free boxes of paper board “breathe” and allow for expansion and contraction of gown fibers subjected to environmental changes in heat and humidity. As the gown is folded, are the folds buffered with tissue? Does the service seal the box itself or leave open? Ask why or why not and if the preservation or the guarantee is void if the seal is broken. Does the service provide a guarantee the dress will not be stained or discolored when the next bride in your family is ready to wear the gown? Be sure you are comfortable with the answers to all your questions. After all, your wedding gown is the perfect gown for you. You want to give your beautiful gown the care that will keep it perfect for the next bride to wear. Only a MuseumCare© preservation is true protection for your gown. Look for our name and look for our logo. Our written international guarantee is backed by members of the Association of Wedding Gown Specialists represented in more than 500 cities around the world. Return your gown to any participating Wedding Gown Specialist, who will inspect and press the gown at no charge. Improper handling of the gown may cause damage and compromise the true preservation of your gown. What is the Association of Wedding Gown Specialists? The Association of Wedding Gown Specialists is a not-for-profit trade association of specialty cleaners; members affiliated since 1990. MuseumCare©gown preservation is their specialty offering a unique guarantee. The local cleaning service provides a written international guarantee honored by any other member of the Association; represented in more than 500 cities around the world. Their process for gown preservation has been tested and endorsed by the Association of Bridal Consultants and the National Bridal Service. Many manufactures carry our labels in their gowns.Exclusive Bridals by A.C.E., Wedding World, Couture Creations, Casablanca Bridals, Dynasty Collection, to name a few. The primary mission is to preserve and/or restore the bride’s precious gown and her memories. Do not wait. 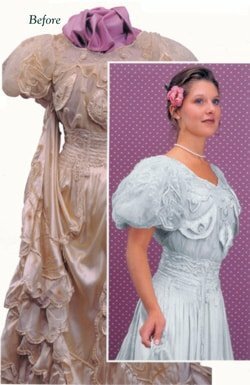 Let us preserve your special wedding dress for your future daughter, granddaughter, or even great-granddaughter! Receive your written 100% international guarantee against sugar stains and yellowing of the gown.